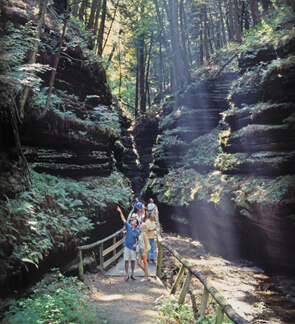 Following the narrow channel winding deep into the cliffs along the Wisconsin River, you’ll discover the hidden glen of Cold Water Canyon — the ideal setting for your special event. Here you’ll find acres of towering pines, sandstone bluffs, and lush fern gardens. Nestled amongst this beautiful seclusion is the Cold Water Canyon Pavilion. 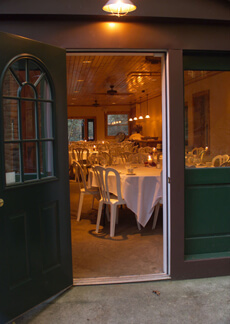 A beautifully refurbished, 700-square foot facility ideal for weddings, reunions and corporate retreats. 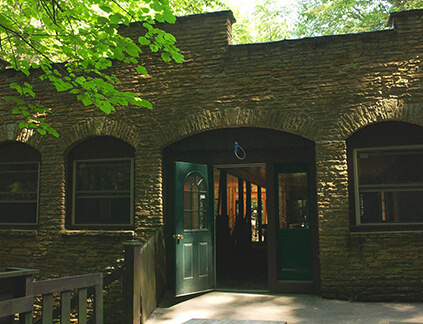 The Pavilion is equipped with a bar, food serving space, fireplace and a large seating area. Just outside are gathering areas ideal for ceremonies, dancing or mingling, a paved area with a 40’ x 40‘ framed tent, restroom facilities, and romantic torch-lit walkways that skirt along the canyon edge from the Pavilion to the scenic shores of the Wisconsin River. With our group planners helping you to select the perfect seating, catering and entertainment options, you’ll be assured of an event, setting and overall experience that’s second to none. CONTACT US TODAY! SEND US AN INQUIRY or contact Stephanie Gunderson by calling 608.254.8555 or emailing groups@dellsboats.com. For a closer look at the Pavilion and Cold Water Canyon, scroll through the photo gallery below. For more information, download THIS PDF.